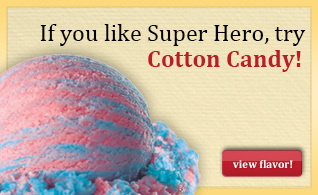 Rescue your taste buds from the dull and boring with cherry bubblegum, lemon, and blue raspberry flavored ice cream. In April, a portion of the proceeds will be donated to Women & Children’s Hospital of Buffalo! 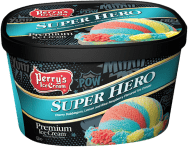 MILK, CREAM, CORN SYRUP, LIQUID SUGAR, SKIM MILK, BUTTERMILK, MILKFAT, WHEY, NATURAL AND ARTIFICIAL FLAVORS, RED 40, MONO- AND DIGLYCERIDES, CELLULOSE GUM, GUAR GUM, CARRAGEENAN, DEXTROSE, YELLOW 5, BLUE 1, CITRIC ACID.